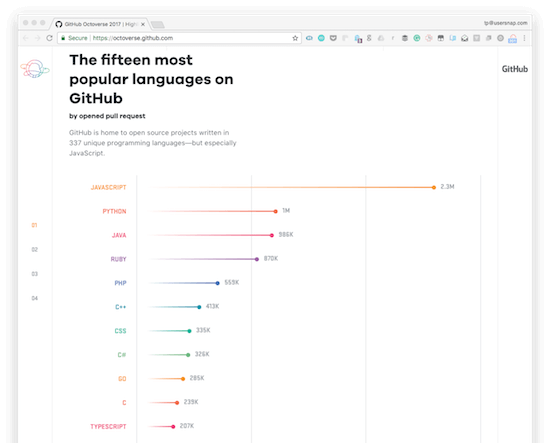 GitHub, StackOverflow, and our own developer survey bring some light to the most popular ones in 2017. No list is complete without Java. In the long run, it’s always a great choice & the stats suggest it’s not going away anytime soon. Java is used on 15 billion (that’s not a typo) devices and over 10 million developers use Java worldwide! Learn Java if you create Android apps, games, software and website content. Example sites that use Java are Amazon, LinkedIn, plus eBay. Java 9 is launching in 2017. So definitely check it out when it’s ready. Python 3.6 got released in December 2016 with some awesome features. Elixir is a functional, dynamic language created for building scalable, maintainable applications. Concurrency is one of its main benefits. It’s great for large applications that handle a lot of tasks simultaneously. Example sites that use Rust are Dropbox or Coursera. Go (or GOLANG) – by Google – is going to grow in popularity in 2017. It has an excellent standard library and it compiles fast. It’s great with concurrent tasks and programs as well. TypeScript is the preferred language for writing Angular 2 apps. Rails is a popular choice for many businesses. Some businesses are Airbnb, Groupon, Twitter, and Shopify. Ruby on Rails 5.1 was released in December 2016. Please take a look at the new features here. Version 7.0 – released in 2017 – offers some incredible features. To learn C# please visit the following pages here, and here. Apple (not the one you eat) built Swift – and they have some big plans for it so it is a good idea to take note of it now. Their latest release 3.0.2 is available here. Take these Swift courses here, and here. HTML5 is the latest version of HTML and it’s dynamic which means that you can create beautiful sites with less code and it does more. It’s a great ‘language’ to learn over the next 3 years. To learn more about HTML5, I’d recommend checking out the following Udemy course. A lot of stylings, animations, and other visualizations are created with CSS. Codepen is a great platforms to explore and try various CSS animations yourself. See the Pen CSS astral loader by Hugo Giraudel (@HugoGiraudel) on CodePen. If you’d like to become a full stack web developer, I’d recommend learning the basics of HTML, CSS, and Bootstrap. Once you advance and progress, learn TypeScript and 2 backend languages that you prefer. Even if you know all the programming languages in the world, it does not mean that you can create bug-free applications and websites. A solid programming workflow, combined with great tools – such as Usersnap – help you report and fix bugs on the fly. Thanks to various online learning platforms, learning new programming languages is easy nowadays. Kyle Prinsloo runs studywebdevelopment.com. He helps web developers advance their careers & grow their freelancing business. I know, I talked about the best programming languages for 2017. Last but not least, I wanted to give you a heads-up on Usersnap, which is a great bug tracking- & testing tool for development teams, used by startups, as well as companies like Facebook, Google, and Microsoft. Improve your websites and web apps in 2017 with a free Usersnap trial. Pretty bold statement right? Well, let’s face it. The web has evolved to a visual place where HTML and CSS have become the essential design tool kit. In today’s blog post I’d like to show you why HTML & CSS are a must-have for UI / UX designers in 2016.